Team Wetaskiwin congratulates Team Esso upon the grand opening of its new station in Wetaskiwin. Left to right in the picture are Aldermen Patricia MacQuarrie, Joe Branco, Glenn Ruecker, and Mark Mcfaul, Mayor Bill Elliot congratulating station owner Nidal Naaman, co-owner Miro Chehayeb, manager Julia Naaman, Imperial Oil Territorial Manager for Western Canada Mark Nadeau and his neighbour Barry Kaye. Inside, the station has a better than average selection of snack foods and groceries plus a fast food counter and tables and chairs to eat at. Best of all, they have my favourite treat, frozen yogurt with one's choice of fruit blended in as it is individually prepared. Mmmmm, good! So far as I know, this is the first time the freshly blended frozen yogurt has been available in Wetaskiwin. The grand opening of On the Run featured free hamburgers and Red Bull, a Bounceroo for the children to enjoy, and three booths of local business or charity or travel. 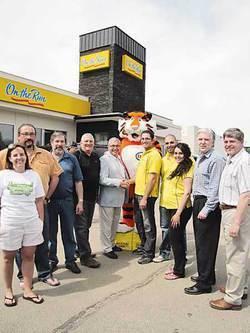 The grand opening ended with draws for gift cards or items donated by local businesses such as Esso or Jiffy Lube. The biggest prize was $500 toward travel, and Youth Unlimited paid out $236 from the 50/50 tickets which they had been selling.